Digital Photolamus artist will create a customized caricature from photo in the theme of friendship upon your request. 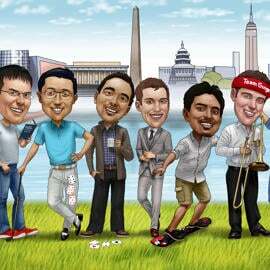 We are ready to create the most funniest and personalized caricature of friends, which you have always dreamed about. Caricature can feature any amount of people as well as we can create a unique image of caricature characters. For example, faces will be hand-drawn from regular photos, but bodies and clothes will be designed individually according to your requirements. Thus, mention your ideas in the requirements box below and upload clear photos of high quality from which will serve as a basis of caricature drawing. You will get a caricature which will be drawn in colored digital style. Digital caricature of friends will be delivered as a ready-to-be-printed JPG File on Email. Additional delivery options, which will make the most creative gift: Digital caricature caricature printed on Canvas, Photo Paper or White Mug of the selected size. Worldwide shipping is available.